Shelley Bean: MPS NSD Challenge #10 - "May Day" and My Very First Give-Away!! MPS NSD Challenge #10 - "May Day" and My Very First Give-Away!! I also made a set of 6 matching cards to go inside. When you close it, you simply tie it shut with the attached satin ribbon. The flowers were made with the Plantin Schoolbook cartridge. I think it is a nifty sort of gift giving idea. With that thought in mind, I have decided to do just that! I am going to give this card set away! Become a follower of this blog by clicking on the google friend follower in the left column of this page. Leave a comment on this post specifying you would like to be considered in the giveaway, and tell me what your favorite flowers are. Share a link to my giveaway on your blog, message board or social networking site, so others can be made aware of it too. Feel free to use any of the images in this post on your link. I will pick a winner using a random generator on June 1st. Also, it is very important that you leave a way for me to contact you, should you be chosen. An email address or blog address would be ideal! ~thanks! Thank you for visiting my blog. The effort you took to come here today has really brightened my day. I love being creative and I especially love sharing what I love with others who appreciate it too. Hi Shelley! Thanks for the chance to win your note card set! It is awesome! My favorite flower is the tulip...it reminds me of home! I am all ready a follower, and will post to the fb craft nite site I belong to. This is such an awesome set of cards!!! I am new to scrapbooking and love to see all the things that can be created.I love exotic flowers. They are vibrant with color. Thank you for giving me an opportunity to win your note card set. I have added this giveaway to my blog...I hope to learn many new things following you. Thank you and happy scrapping. New here. Glad i stop by. thanks for the chance to win the set of cards. Great give away. Congratulations on this being your first ever. My favorite flower is the rose. Thanks so much for letting me know that you were able to use my note card folder design. You did a great job and your flowers and cards are so beautiful! I love to be in the drawing for this giveaway! Thank you so much. My favorite types of flowers and paper and cupcake paper flowers as well. Love your card by the way, super cute. I love all flowers, but the best of the best has to be deep red roses. Would love to win. your paper flowers are gorgeous. I love your rose flowers. Thanks for sharing. Darling and what a great idea for box set gifts! What an awesome idea. I'm new to the Cricut world and am looking forward to making these. My favorite flower is the Hydranga. It reminds me of my mom. She has so many flowers, but her Hydrangas are beautiful. These are very cute! I know how long it takes to make a set of cards. I appreciate your generosity in giving them away to a lucky winner. I'm so glad I found your blog. I would love to win your notecards. My favorite flower is the lilac because it smells so good. Saw your give away on Capadia Designs. Went to your blog and loved what I saw. A chance to win your lovely work is so nice of you. I am not sure how to do it but I will mention you on my blog or Facebook, whichever one I can figure out how to leave a link. (I am new at this technical stuff). Capadia mentioned you and I had to come to your blog. Became a follower. Very nice blog!!!! The note card set is beautiful. Would love to win . Thanks for the chance. 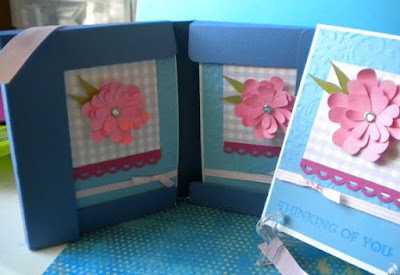 I saw your lovely cards and flowers over on Capadia's blog. I'm signing up to be a Follower and would love to win your cards and flowers. Thanx for chance to win! I came from Capadia's too. Love your flowers and that cute note card holder. I think I'm wishy washy because my favorite floweriswhichever one I'm sniffing or looking at at the moment. If I had to pick one I guess it would be the Iris. I'm a follower. I love your site and the flowers that you made. I will let my scrap booking meet up about your site as well. Thanks so much for sharing. Hope I win the beautiful card holder set and flowers. I don't have a favorite flower...I like them all! Your project is so pretty! your projects are very pretty!! What a GREAT give-away! love your flowers and note holder. what a great give-a-way! Wow Shelley!! You have been busy!! I love all your new cards and especially your monochromatic flower card GORGEOUS!! I AM going to get time this summer to actually copy some of your gorgeous creations :) More importantly I AM going to get time to come and see you!!!! Such a lovely card set. I just became a follower. So glad I found this site (saw the link on Capadia's site). Such a nice give away. thanks for the chance. To ask a master gardener what their favorite flower is can be quite dangerous. We are all plant collectors. I tend to be partial to iris and daylillies but I have never met a flower that I dislike. hi Shelley!!! So beautiful!!! What an awesome giveaway. You are so generous!!!!! I LOVE calla lilies and lily of the valley...... Elegant and simple, classic.... The fragrance is divine!!!! Will add your giveaway info on my blog! I just became a follower of your blog. How cute your cards are. Please add me to your drawing for this adorable card set. Also my favorite flowers are Bird of Paradise. Just found your blog thru Capadia. I loved your card with the beautiful pink flower on it. Thanks for sharing. I'm so glad I found you on facebook...what a great giveaway. I would love to win this..its so beautiful..thanks for the inspiration. lovely cards, you do a beautiful job. Love, love it. I did become a follower and now going to go get you to be my "friend". Gorgeous work, I just found your Blog, and am not really up on joining so hope I have done it right. Your flowers are beautiful. You are so talented, the flowers are amazing...And they would make a great bday present to me. :) Thanks for the chance to win! Everything is so beautiful. Thanks for giving us an opportunity to win. My favorite flower is Daisies. My name is Phil Kerfoot I was browsing internet and found your blog. The author did a great job. I will subscribe to your RSS feeds. Thank you for your contribution. I am a web designer myself. And here some examples of the websites that I designed for bad credit loans loans company. So super cute and a great idea! My favorite flowers are tulips. Thank you for the chance to win!